A member of the NBA's elite, Steph Curry is already one of the all-time best three-point shooters in league history, and he still has multiple years left in the tank. With a second NBA title and a pair of MVP awards under his belt, Stephen Curry rookie cards have exploded in value and interest. From a collecting perspective, the rookie year for Steph Curry was defined by transition. The season marked the beginning of Panini's NBA exclusive, the end of Topps basketball, and a fundamental change for Upper Deck. Although the basketball collecting landscape would never be the same, collectors are left with a good mix of Steph Curry rookie options. 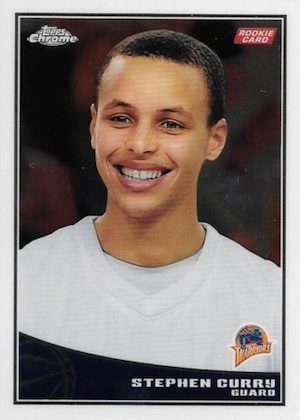 See also: Full Stephen Curry Rookie Card Gallery and Checklist. 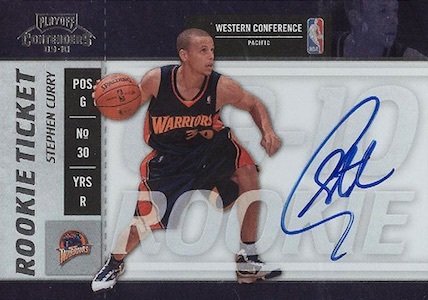 The following list looks at some of the best Stephen Curry rookie cards available. Autographs are the most popular option, but there are also several base cards that remain on the collecting radar. 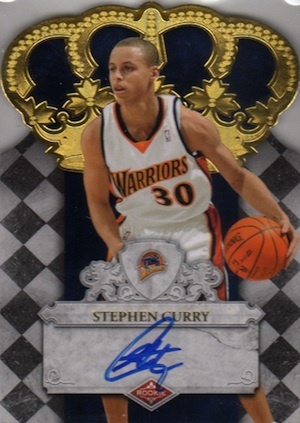 For a real-time snapshot of the most popular cards that are currently on eBay, check out our Stephen Curry Hot List. 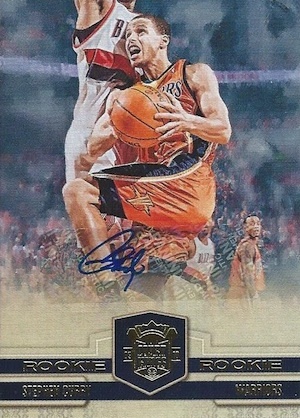 2009-10 was Upper Deck's swan song as an NBA-licensed product. Although Panini owned the NBA exclusive starting that year, Upper Deck produced their last few NBA sets during the 2009-10 season. While a majority of the cards show players in their NBA gear, this did not extend to the incoming rookie class. 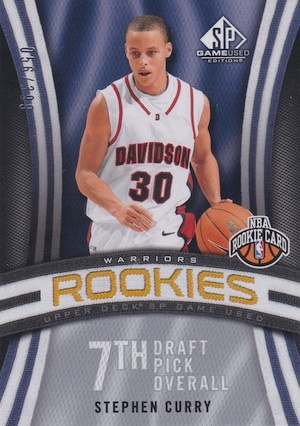 Sporting his Davidson jersey, this Steph Curry rookie card is a short print. There is also a First Edition version that looks very similar, but is card #196 instead of #234. Like Upper Deck, 2009-10 was the last year Topps produced NBA products. As seen below, the rookies were given the photoshop treatment, but values were not hurt by this. Collectors looking for the Topps Chrome rookie for Stephen Curry should know that there was not a standalone Chrome product in 2009-10. The cards were issued as numbered inserts (#/999) in the flagship Topps basketball product. Refractor (#/500) and Gold Refractor (#/50) parallels remain in high demand. The base Topps rookies for Curry don't match the Chrome version as far as demand is concerned but still command impressive values considering they are very basic and not numbered. 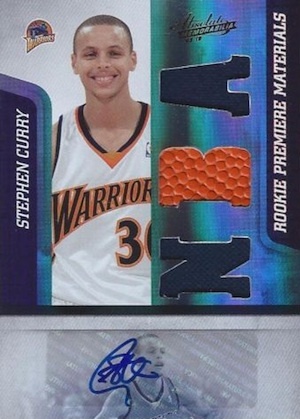 Showcasing a somewhat busy design, Steph Curry's 2009-10 SP Game Used rookie is limited to 399 copies. 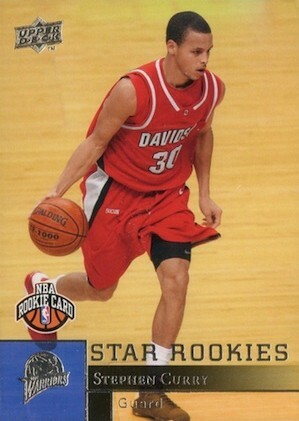 This is the rarest of the base rookie card choices for Curry. Stickers are never the preferred route for collectors, but the quality of the 2009-10 Court Kings card design and subtly of the sticker make it easier to accept. The higher print run keeps values somewhat in check for this Stephen Curry rookie card. There is nothing subtle about 2009-10 Absolute. 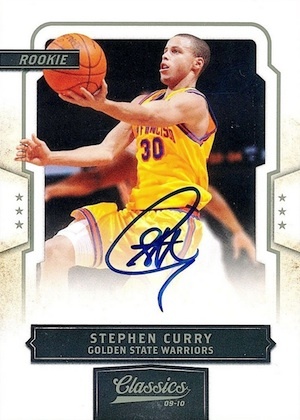 The crowded card features a Refractor-like finish and manages to only devote 25-30% to an image of Curry. The rest of the card is segmented for the text boxes, autograph sticker and relic pieces. 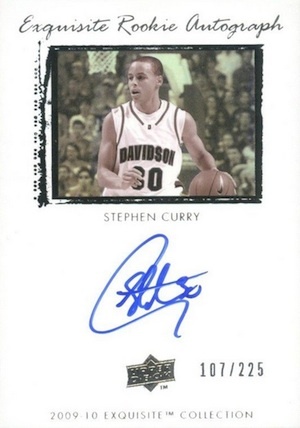 Definitely one of the unsung heroes of the Stephen Curry rookie checklist, 2009-10 Classics brings a solid design, on-card signature and mid-level print run. Collectors looking for the best value should check these cards first but prices are certainly not cheap. While they are not as popular as the football cards, 2009-10 Playoff Contenders Rookie Tickets are also hard-signed and feature a limited print run. One added perk for Curry collectors is the oversized signature. Although the exact print run was never revealed, Panini noted that the Steph Curry Contenders rookie was part of a group limited to 649 copies or less. Despite this higher production range, the cards sell for strong values. One big thing to keep an eye on is the quality of the signature. Many of these appear to have ink issues, so try and check out a close-up image of the autograph during your search. Although the checkered background is a little odd, the 2009-10 Crown Royle die-cut autograph card delivers everything that collectors look for in a rookie. The gold foil crown adds a bold flash to the Stephen Curry card, and the on-card signature and low print run seal the deal. The top two cards quickly push into the ultra high-end collecting world. As the last NBA edition of Exquisite, collectors get a classic rookie card design with a college theme. Heavy white encompasses most of the card except for a small image box and foil text. This leaves a ton of room for the signature, which rivals Contenders as the largest on-card autograph among Stephen Curry rookie cards. The print run is only 225, but there are actually two cards in the base set. Card #72, shown second, is also numbered to 225 copies. Starting off with a bang, 2009-10 National Treasures was the collecting debut for the premium Panini product. It is easy to see why this became the standard for high-end basketball over the years. 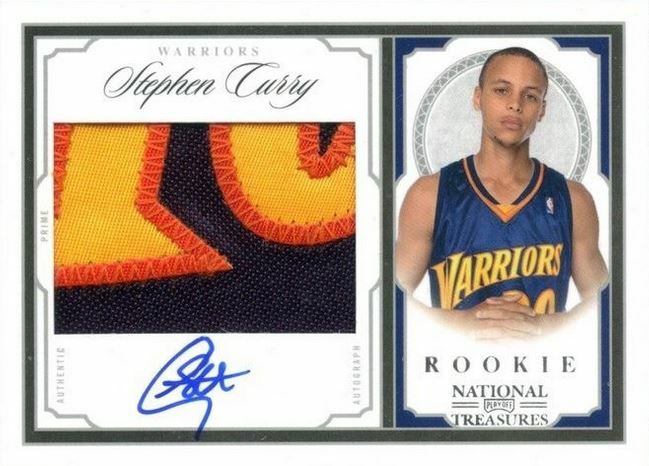 A large patch piece, on-card signature and low print run make this the most valuable and rare Stephen Curry rookie card available. Did you know that Curry’s .440 career three point percentage is the highest in NBA history among players with at least 1,000 attempts? 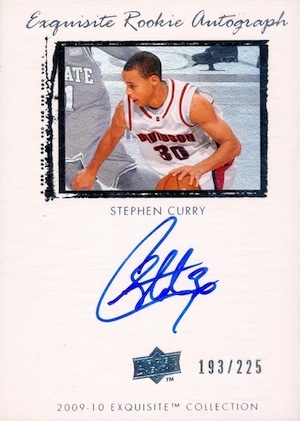 I have a 2009 #33 of 100 Curry autograph rookie Exclusive signature card,what is it worth?Thank you.